Lewis Hamilton’s life at the speed of Formula One added another layer of intrigue last Sunday when Mercedes teammate Valtteri Bottas scored his breakthrough victory in the VTB Russian Grand Prix. Already dealing with a rejuvenated Sebastian Vettel and Scuderia Ferrari _ winner of two of the season’s first four FIA Formula One World Championship events _ Hamilton found himself closed-out of the front row after qualifying last Saturday and off the podium at the finish of the 52-lapper around the 3.634-mile/5.848-kilometer/18-turn Sochi Autodrom. Bottas, hired away from Williams F1 to replace reigning World Driving Champion Nico Rosberg after his shocking retirement, held off Vettel by 0.617-seconds. The fifth-year driver earned the win in his 81st career Formula One start but only his fourth with the Silver Arrows. Bottas calmly brushed aside the notion that he was driving “angry” as No. 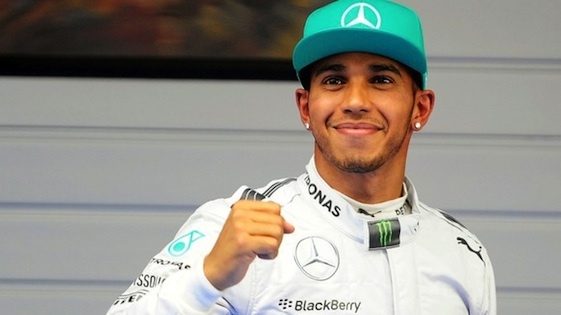 2 driver to triple world champion Hamilton and the organization that has dominated the series the past three seasons. Bottas admitted that hearing the Finnish national anthem on the top step of the podium was quite special. “I have to say, felt good,” said Bottas, a 27-year-old native of Nastola, Finland. “But it is a little bit surreal _ first win, and hopefully first of many. It was definitely one of my best races, personally, ever. It’s a good feeling and just, yeah, happy. The victory also kept Mercedes’ record at Sochi Autodrom perfect, as the manufacturer won the Russian Grand Prix in 2014 and 2015 with Hamilton and the 2016 race with Rosberg _ as much an archrival as he was teammate to the flamboyant Brit. Ferrari’s Kimi Raikkonen finished third with Hamilton placing a distant fourth after dealing with intermittent overheating issues for much of the race. Hamilton, in fact, failed to lead a lap for the first time since the 2016 Japanese Grand Prix. A helmeted Hamilton did stop briefly in parc ferme to congratulate Bottas, who later met and exchanged small talk through an interpreter with Russian President Vladimir Putin. Bottas is the fifth Finn to win in F1, a list including world champions Keke Rosberg, Mika Hakkinen and Raikkonen and Heikki Kovalainen. “For me, that’s the only goal in my career, so we will keep pushing for that,” said Bottas, who is working with a one-year contract. “Amazing. It took quite a while, more than 80 races for me, but definitely worth the wait, worth the learning curve. This strange opportunity came to me in the winter to join this team and they made it possible. So I really want to thank to the team, without them it wouldn’t be possible, so feels amazing. Magnussen qualified 14th but started 13th due to a five-place grid penalty served by Toro Rosso’s Carlos Sainz Jr., who qualified 11th. Grosjean qualified 20th but started 19th as 17th-place qualifier Stoffel Vandoorne of McLaren also served a grid penalty. Grosjean’s race ended quickly. A collision with the Renault of Jolyon Palmer in Turn 2 of the opening lap bounced Grosjean’s No. 8 Haas VF-17 into the wall and out of the race. He was classified 19th. Four rounds into the 20-race schedule, Haas F1 Team remains seventh in the constructor standings with eight points, five behind sixth-place Toro Rosso and two ahead of eighth-place Renault. Grosjean and Magnussen are tied for 11th in the driver standings with four points apiece. Bottas and his No. 77 Mercedes got the jump on both front row Ferraris at the start, leading into Turn 2 over Vettel, Raikkonen and Hamilton. From there, Bottas only lost the lead during pit stops. Bottas completed the distance on one stop, switching from Pirelli’s ultrasoft tires to supersofts after 27 laps. Vettel extended his championship lead over Hamilton to 13 points (86-73), while Bottas closed in at 63 in third, with Raikkonen fourth at 49. In the constructors’ stakes, Mercedes AMG Petronas leads Ferrari by a single point (136-135) with Red Bull Racing third and fading fast at 57. Formula One takes this weekend off before returning May 12-14 for the Spanish Grand Prix at the Circuit de Barcelona – Catalunya.